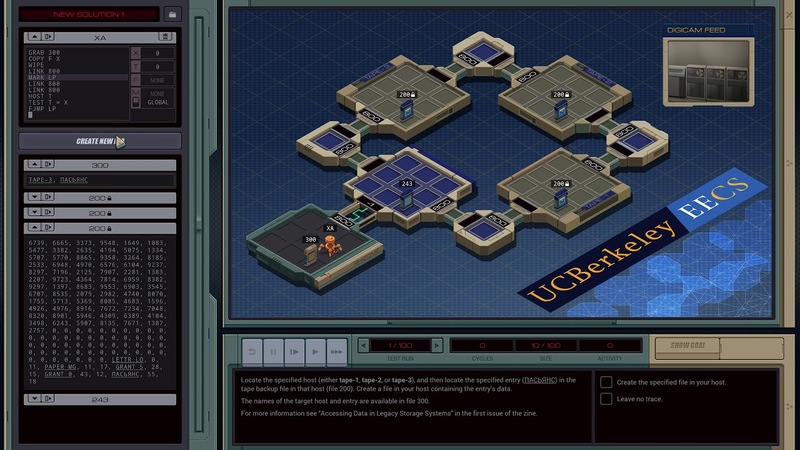 Zachtronics is back with another ‘programming’-like puzzle game for the PC. The small game developer headed by Zach Barth has been making a name for itself with creating whacky engineering games that require the player to rub all of their braincells together. Exapunks is no different. 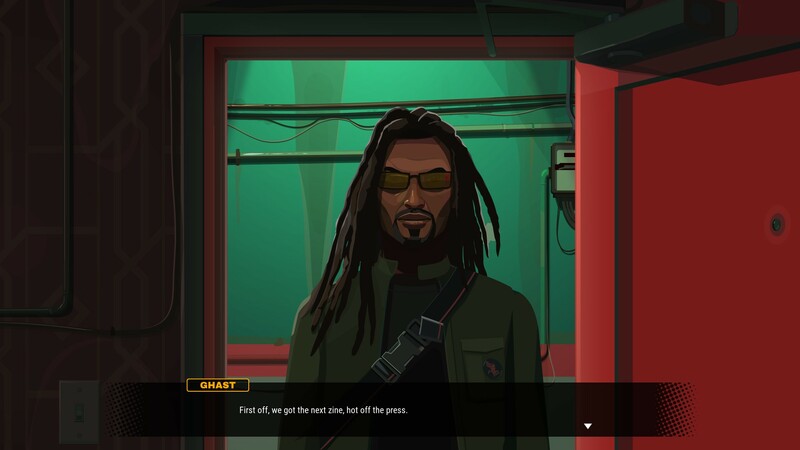 It has a storyline inspired by the Cyberpunk genre. Set in an alternative 1997 you the player are a hacker who needs to cure himself a computer born illness called The Phage. With medicinal doses running up to 700 dollars per day the user is required to start hacking for money. It beats working for a credit card company that pays 10 cents to copy over a receipt. The latter is a task which the game actually requires you to perform. 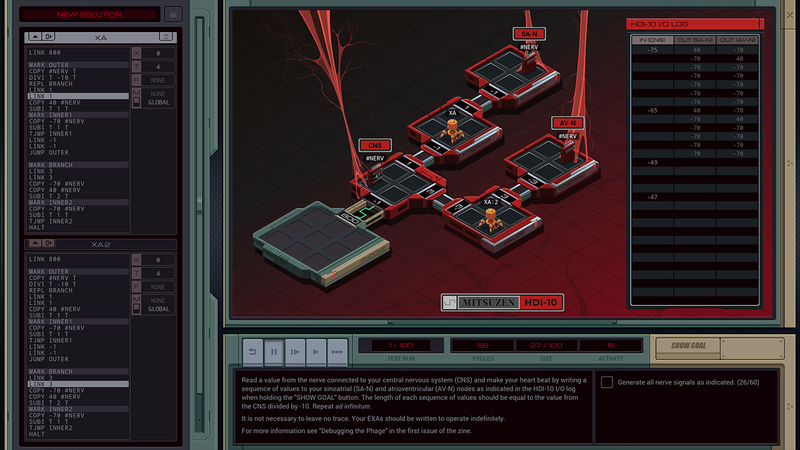 The Exapunks storyline is arguably thin, but it sets a good atmosphere to start puzzling. After receiving information on the target through the email you are repeatedly taunted by the A.I. to get the job done. The phony chat window and the well crafted e-zine manual finish the decors. So what is the game about? Well, just like Shenzhen I/O you use a programming language to code your Executable Agent or EXA. Once let loose you can watch as it attempts to complete the hack, or puzzle! So what kind of puzzles can you expect? Well, they start of easy, with commands you can navigate through systems, grab and read files or even destroy them. Essentially you are moving across the board, as shown in the screenshots, with commands such as ‘link 800’. This means your Exa is ordered to move to the sector that has the link id 800. Using these simple commands at your disposal the player is tasked with a number of menial puzzles to get a feel for the game. In the meantime the story is also expanded as your friendly A.I tells what she wants in a somewhat sardonic tone. After a while the puzzles get harder. 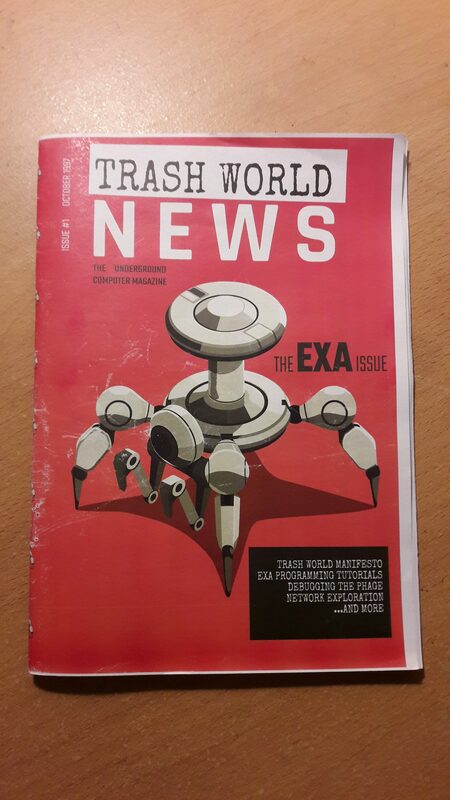 They require complicated branching, data transmission between Exa’s and the use of recursive algorithms. Sufficed it to say, the difficulty curve becomes steeper. Each puzzle caused an exponential increase in time to solve. To add to the problems you are also expected to create a generalized solution capable of taking on every variant of the puzzle. Exapunks can become frustrating to play. I do a lot of software engineering and in the past performed some ethical hacking. Those things can become a time sink in which the rewards may not feel like being worth it. Exapunks is similar. The programming language and problems of Exapunks take a while to fully understand. The fact players are constrained by factors such as EXA size means your solution will often require rework. And so I add that Exapunks is not for everyone. The same can be said of Shenzhen I/O or any other Zachtronics games. They are not really meant to be for everyone. If you know programming and computers, or you want to do more beyond the basics and you like Cyberpunk than Exapunks is for you. 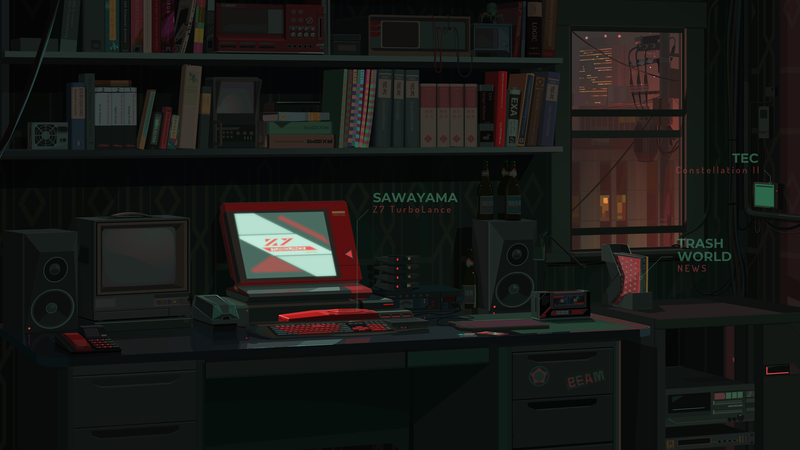 With minimal computer hardware requirements it is a puzzle game that can potentially remain on your hard drive for years to come. Exapunks currently retails of $ 19.99 which I think is well worth it. I got the game at discount so wait if you are not comfortable with the price.